Merle’s BAS blocks arrived the day before I attended the Ricky Tims Seminar, and I loved them as soon as I saw them, but did not even think about working on them amid all the seminar activity. Their time has come now and I’m happily embroidering away. 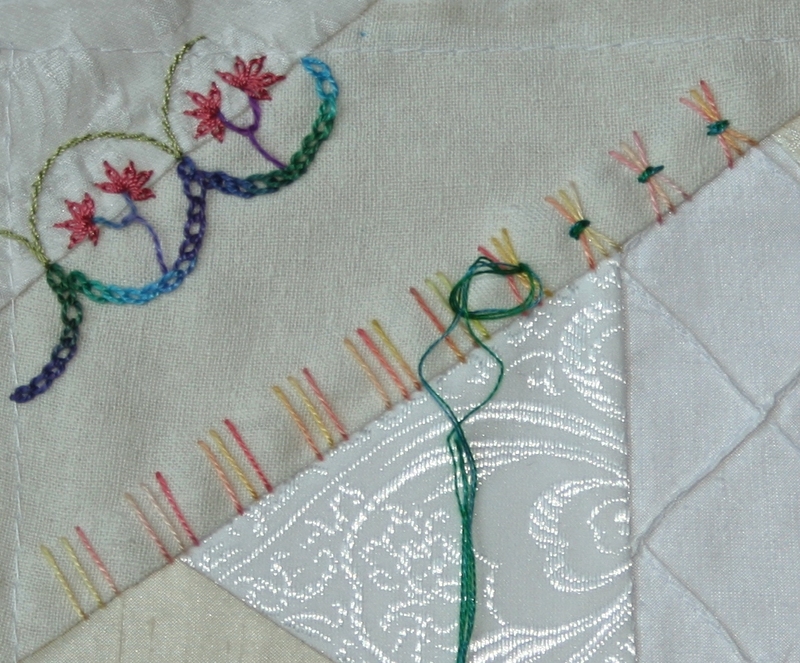 This block features the Cretan stitch and I added to Rose Anne’s base stitching in the upper right corner. Mini irridescent (purple/blue) bugle beads and detached chain stitches in black Perle Cotton size 12 were added to the points. I first sewed the beads down with SoNo thread then went through again with the Perle Cotton. Next I added a funky Cretan Stitch to the lower lime green seam with variegated Perle Cotton size 5. 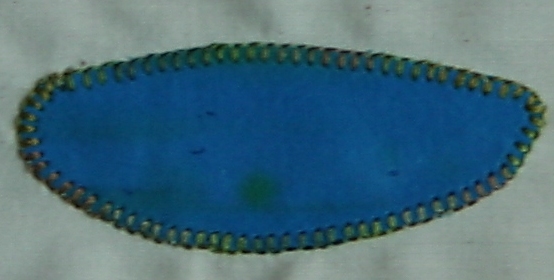 One edge was kept uniformly short, and the other was varied to create a triangular design. 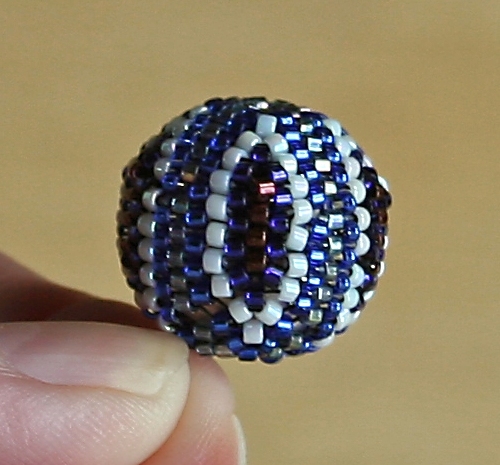 This thread is the same color as the blues and purples of the mini bugle beads. These would be lovely as jacket buttons, purse closures, or made into pins. 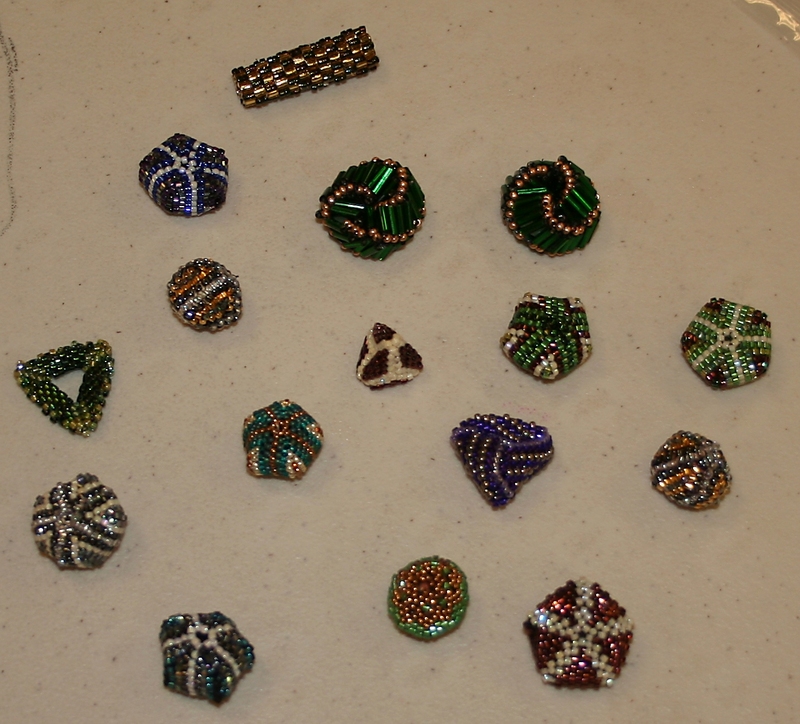 We’ll be making the open triangle beaded bead at next month’s meeting. I have a specific plan for that shape, and will share pictures of that project as it is being made. She’ll be showing us how to paint on copper in a future meeting. 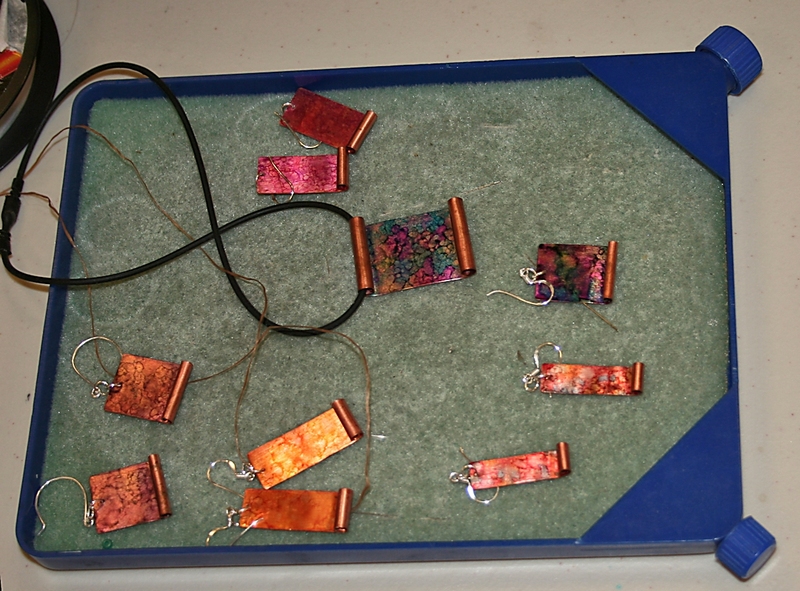 Since I love copper, I can not wait to learn that technique. 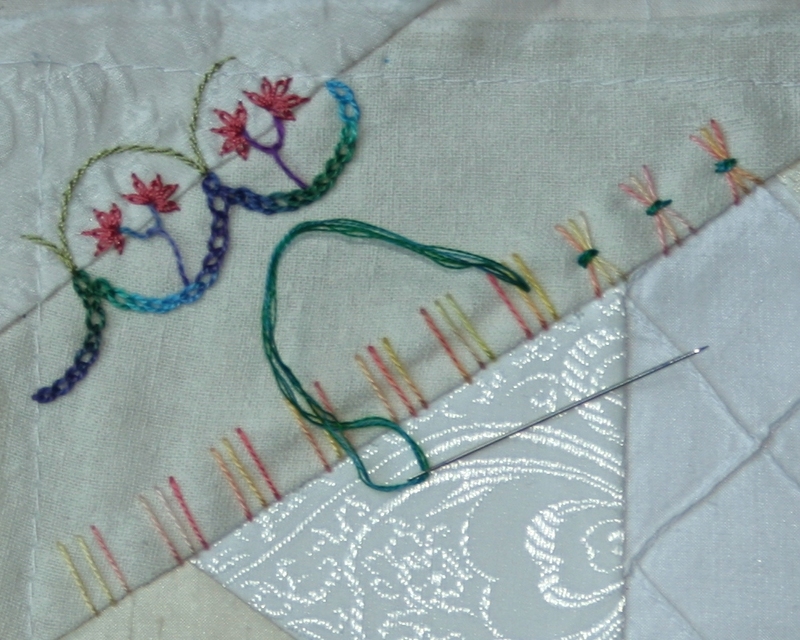 but it takes a long time for that stitch to sew around an applique, and I’m no spring chicken. I was sitting next to a friend, Julia and she commented why doesn’t he use a thicker thread and the single buttonhole stitch? That was a brilliant idea and exactly what I decided to test. My Pfaff Creative Sensation has more than one buttonhole stitch so first I test sewed 3 of them with regular 50 wt sewing thread. My favorites were 2.8 and 2.9 set at 2.0 width and 2.0 length. I tried 30 wt Madeira cotton and stitch 2.8 – the double buttonhole stitch on my machine. It looked very nice, but that still took a lot of time. Success – in 1/3 the time!!! My stitching isn’t as accurate as Ricky’s but with practice, I hope to get those 3 stitches at the points to touch each other. This one shows 2 of them touching way over on the right side, so I’m getting there. Whew, what a weekend!!! It was 3 days filled with lots of laughter, superb workmanship, and the clearest instructions I’ve ever experienced from a workshop. I don’t think I’ve laughed so much in years. Alex Anderson, Libby Lehman and Ricky Tims click – big time. All three know how to entertain and teach. The power point presentation on a huge screen made it easy to see for the entire 740+ in attendance. Justin also manned the camera for all the sewing machine demonstrations, and that man knows how to get great close-ups and clear pictures. He would zoom, focus, and knew how to avoid shadows/bright spots from the overhead lights. One of the nicest things he did, was cover the lens as he moved the camera. None of those disorienting jerkly movements projected onto that big screen. The volunteers did a wonderful job of registering, welcoming, and manning the sales tables, while the white glove ladies were there to turn the quilts for us. Thank-you ladies. It was a long weekend and you really worked hard. I’ve been quilting for 36 years now, and was very happy to learn a lot of new tips and techniques. The piped bindings were gorgeous, I actually might try some applique now, and some circles are definitely in my future. Isn’t that different from anything you’ve seen from Alex Anderson? The wonderful feather quilting around the contemporary pieced center made me stop and look twice, then 3 times, then I kept on going back to see it day after day. It definitely grabbed my attention. These were not made with an embroidery unit. 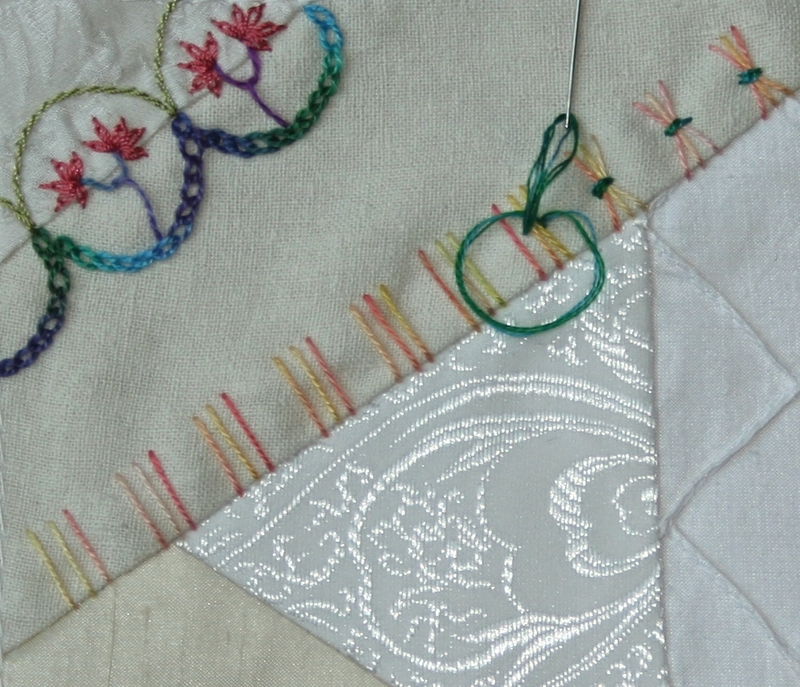 Libby used Bernina’s circle attachment, and lots and lots of the decorative built in stitches on her machine. 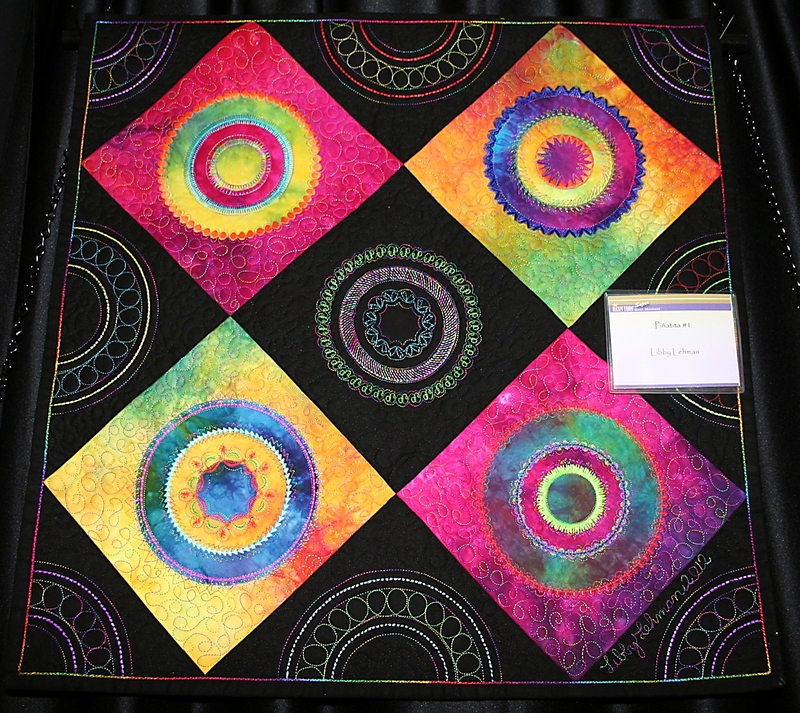 Reverse applique created the bands of color, and she filled in with free motion quilting. I loved the couched pearl cotton on this and could not figure out how it was accomplished. We found out on the third day that Bernina has a new free motion couching foot, and that is how all those beautiful spirals were sewn down. 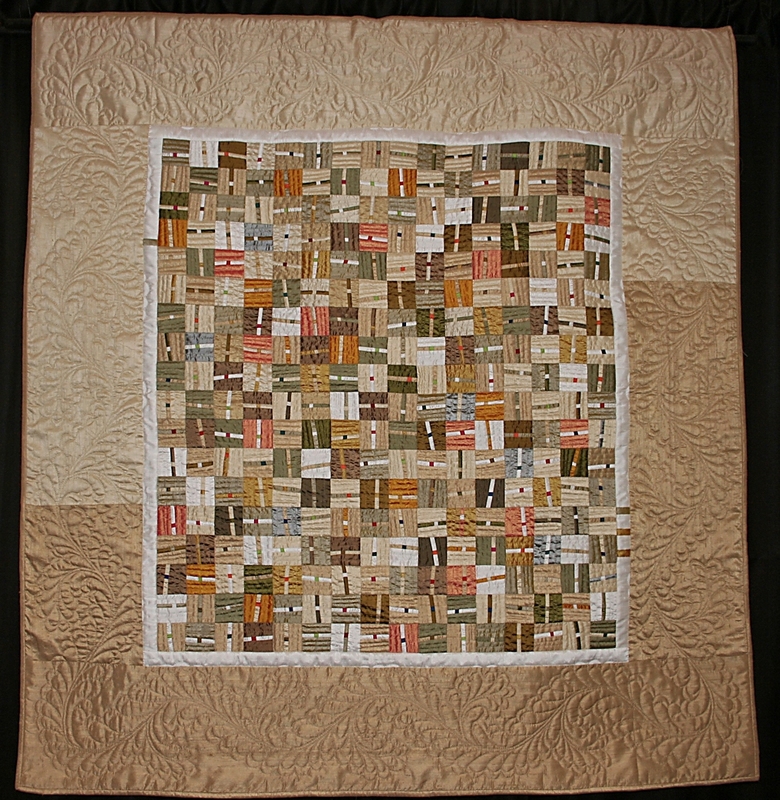 Everyone of the 3 quilts I posted have multiple things in common that drew my attention. First and foremost was color. Alex’s color choices were subtle, Libby’s use of a black background made her colors pop, and Ricky’s colors made me happy. The quilting, oh my the quilting – both Alex’s hand quilting, and Libby’s and Ricky’s masterful machine quilting was outstanding. 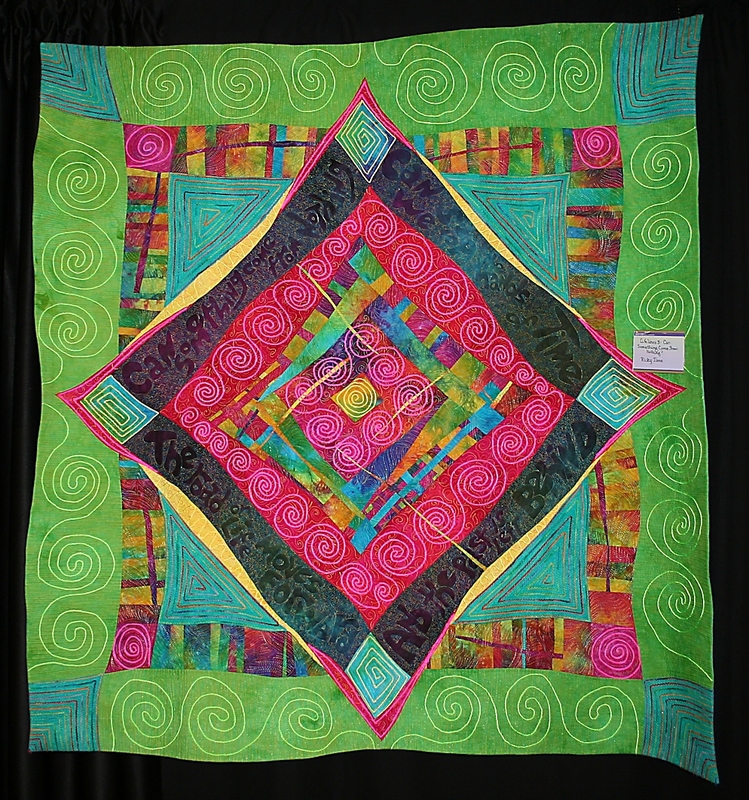 All the quilts were wonderful examples of well designed, well executed art work from experts in their field. There is nothing like seeing works of art like this in person, and if you ever have an opportunity to attend one of these Super Seminars – run don’t walk to sign up. You will not regret it for a minute. Jackie’s Build A Seam Round Robin blocks were mailed out this week. They were really pretty blocks, but I had such trouble figuring out what to add to them. And I apologize to Jackie because I messed up one of the blocks by using the wrong stitch on it. Mea culpa. Each of the blocks are supposed to be variations of a specific stitch, and I didn’t realize it until I had completed my first embroidery, so the stitch I was supposed to use on that block, I used on the anything goes block. I also came up with a variation on a variation that I haven’t seen anywhere, so here is a mini tutorial on Straight Stitch combined with a Detached Twisted Chain Stitch. I used my hand dyed Pearl # 8 cotton thread for the straight stitches embroidering 3 straight stitches, leaving a space, then embroidering another 3 straight stitches. You want to be careful to maintain even spacing for this base stitching. You’ll slip the needle under that end stitch again, and make sure the thread loop is twisted. Then you put the needle through the thread loop, and pull the needle through to form the twisted chain stitch. 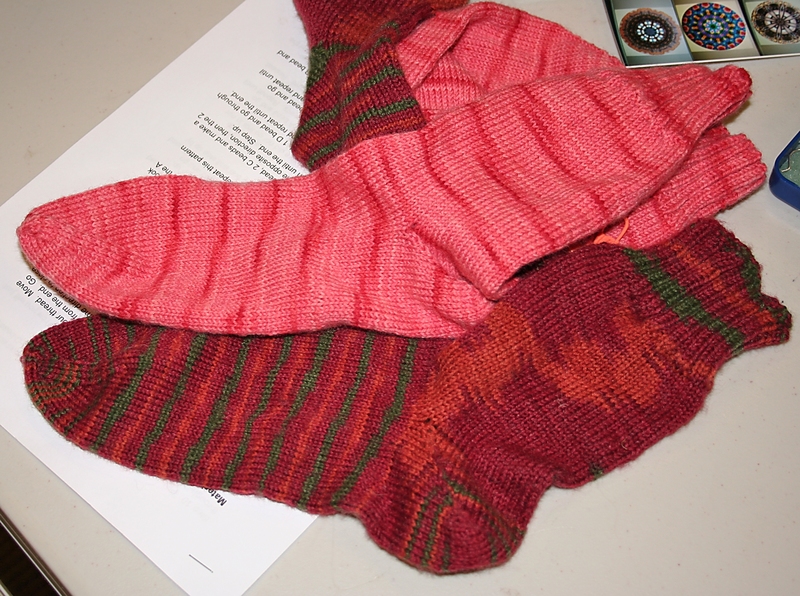 A gentle tug will snug that stitch nicely into place. Bring the needle down through the fabric to secure the stitch, and you have one detached twisted chain stitch completed. The picture I saw of this stitch combo had the second color thread traveling across the top of the embroidery, but I spaced my straight stitches pretty far apart, and wanted to make sure there would be no long threads to catch on something, so the long traveling thread is on the back. I hope you like this little tutorial and will try the stitch combination. 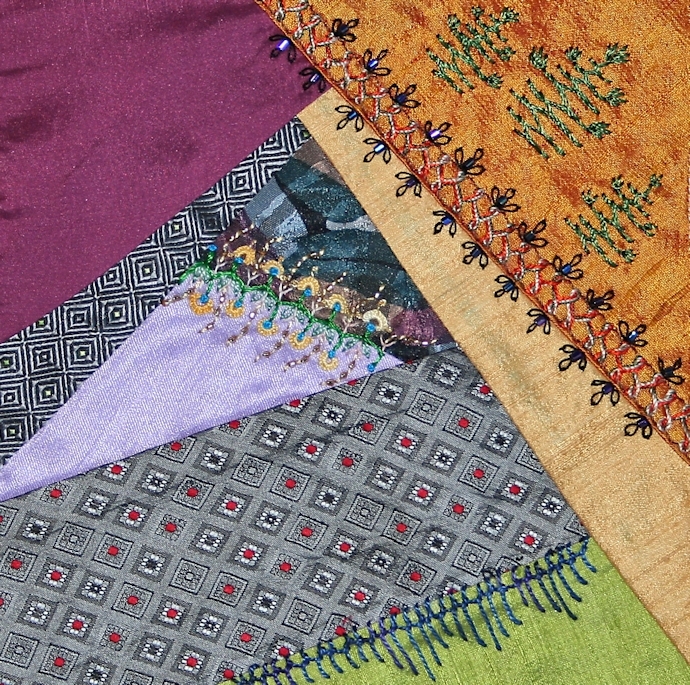 It has lots of possibilities – adding beads, using different thread or yarn weights, and on, and on, and on.